The second quilt glorifying that late afternoon sun on Lake Como...called Buona Sera (Italian for good evening). And entirely of discharged fabrics, cotton, linen and raw silk. You can see my quilted signature at the bottom of the lower image. I finally began signing my quilts a couple of months ago, although on some pieces I simply forgot! So it's a habit I'm trying to get into (preposition in the wrong place, notwithstanding). Off to work today for another 2-day week. My normal work weeks are only 3 days so I have no complaints...an extra day off is always a blessing, though. 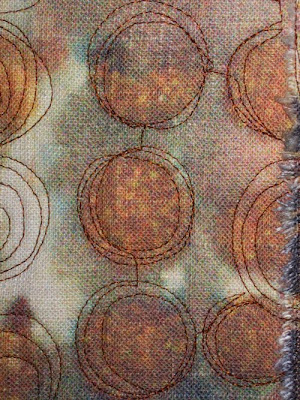 I'm finishing up 3 yards of rusted silk charmeuse this morning. Will write another post about rusting before the end of the week, as I've learned a few things in making this big piece on commission. Another Anniversary Giveaway, this one on Collage Journey to celebrate one year of my daily collage practice. I'm giving away a pack of 8 recycled notecards with images of some of my best collages. To enter this Giveaway, leave a comment at Collage Journey sometime between now and midnight December 31. I'll do a random drawing and announce the winner on January 1. Thanks so much for being a part of my collage journey this year. Happy New Year, again! As promised, I'm having a Blog Giveaway to celebrate my first anniversary as a studio quilter. This piece, Off The Wall, is what I'm giving away. Although it wasn't framed in this photo, it is now, and it looks smashing on a dark bronze metallic framed canvas. To enter the Giveaway, leave a comment on this blog by midnight, December 31. Your comment can be to this post, or to any other post I write here before year end. I'll do a random drawing and announce the winner on January 1. Happy New Year! Another cool anniversary event ~ I started a Textile Sales blog over the weekend, and I've got 17 of my 10x10" pieces from the 2009 Weekly Quilt Series listed there, each one available for just $50 (plus shipping, and sales tax in CA only). That's 60 percent off the original price of these quilts, and considerably less than they are now at Etsy. I think I might be phasing out my Etsy shop, we'll see how the sales blog does. Anyhow, to purchase anything from that blog -- and I'll be listing more items as times goes on -- just email me and I'll send you a PayPal invoice. Thanks for being part of my creative journey this year! 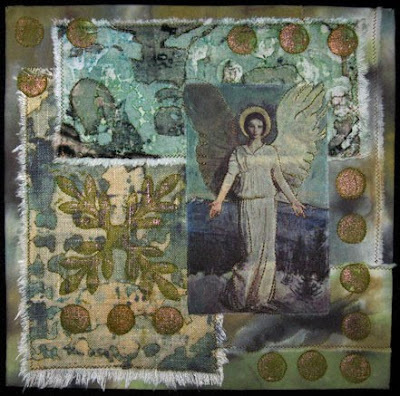 I finish out this year with a second quilt for week 52 -- this one called Goddess of Light, featuring another silk habotai digital image of this angel that I've taken a shine (pun intended) to recently. I hope to get Lake Como 2 finished this week -- it's ready to quilt -- so this year is not completely over yet! But it's a great time to review what I've accomplished this year, and compare where I am now with where I was a year ago...so here goes! 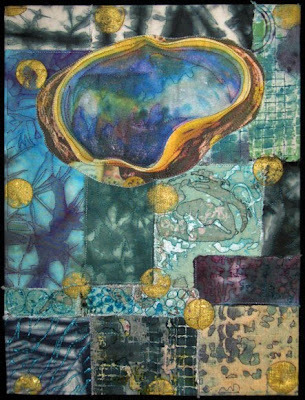 I became an Art Quilter in 2009 -- technically I started in late 2008, but it wasn't until this January that I decided to take it seriously. I completed 54 10" x 10" weekly quilts (2 this week, 2 in week eight). To see them all, have a look here. I had my quilts in six shows this year, two of which used images of my work on their printed brochure or website. 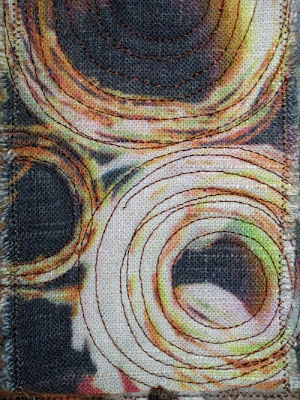 I completed 10 digital quilts (5 in addition to the 5 included in the weekly series). I completed 7 collage quilts (4 in addition to 3 in the weekly series). I completed 9 discharge quilts. 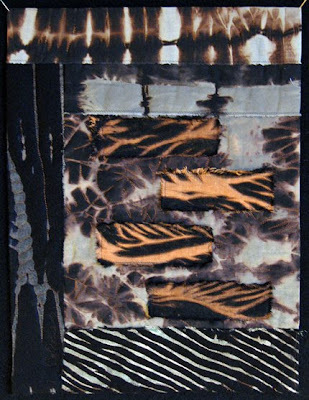 I completed 6 shibori quilts (3 in addition to 3 in the weekly series). I completed an additional 8 studio quilts that don't fit in any of the above categories. I finished 3 lengths of handwoven art cloth -- when I was still making art cloth earlier this year. I downsized my life considerably, moved from a 1700 square foot house in Eureka to sharing a 600 square foot mobile in Fortuna, moved into and set up a new art studio. I started working part time, at a job I really love. I have an upcoming opportunity to do some writing about my art. 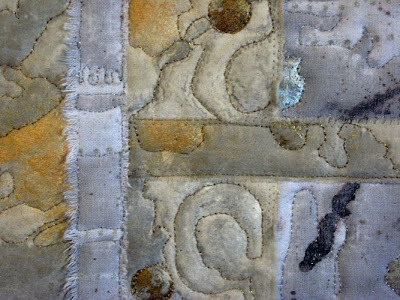 I started this year as a weaver primarily, who had ventured into surface design and used a few pieces of fabric she'd created to try her hand at art quilting. I ended the year with my loom and boxes of weaving yarns in deep storage, and firmly entrenched in the art quilting world. The interesting thing is, I started the year without any concrete goals -- just a vision of what I wanted to create for myself. This was probably the first year that I didn't have a list of stuff I hoped to accomplish, and I probably got more done this year than in several prior years combined. So I'm not going into 2010 with a laundry list of stuff to accomplish, because I already know I'll be very productive, that I'll grow as an artist, and that life will bring me continuing good opportunities to live my vision. I don't think I need to wish for anything more! My latest collage quilt...the best of the recent bunch IMO. And this is the one I had decided not to do! Oh well, mind's change and I think I'm back into this genre of quilts. 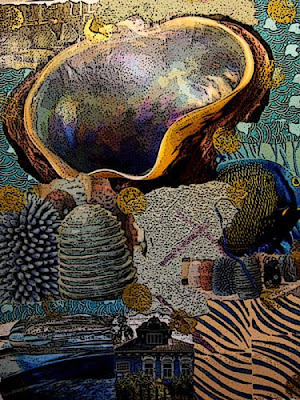 Anyhow, it's called Mother of Pearl, the star of which is that big abalone shell, which in the quilt is a digital image from the original collage, last photo below. 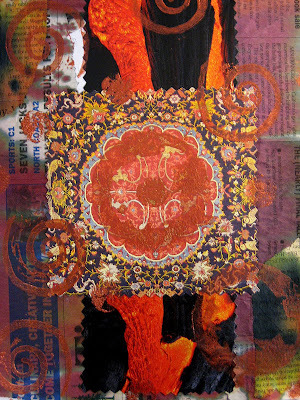 I'm sure there will be more collage quilts in my future -- meaning, based on my daily paper collages. I have a never ending supply of those, enough to keep me quilting just these for the rest of my life! But of course, there will be lots of other quilts as well. I've found my medium, after years of working in numerous other areas creatively. 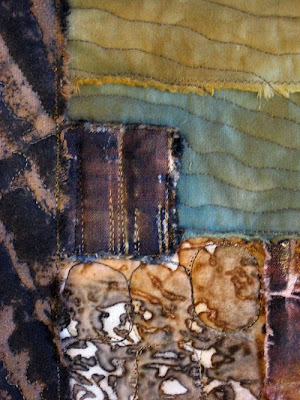 Art quilting is seeming to bring it all together for me. Hope you're all having a lovely Christmas Day. Soon as I finish up here, I'm off to the studio. Today is just another Friday for me, which is just how I want it to be! Ahh, the end of this year's weekly quilt challenge, and a wonderful sense of completion...but wait, there will be another quilt for this week, in a day or two, with another iteration of the same angel. This one, number 52/09, is called My Guardian Angels. The story behind the making of it (there's always a story, isn't there?) 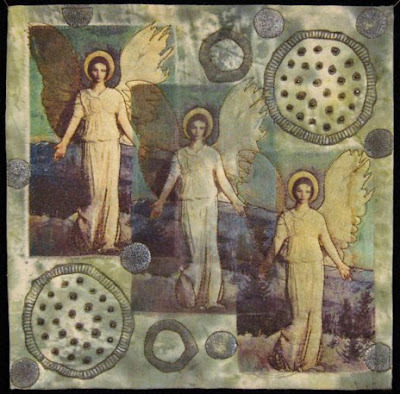 is that I found this cool angel painting in a magazine not long ago and I scanned it into my computer. 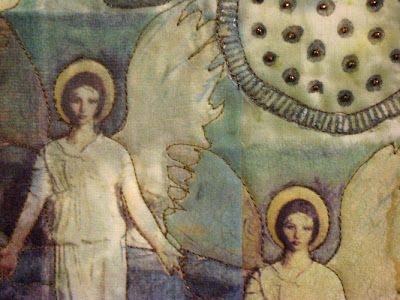 I'd been wanting to work with sheer fabric for a while and printing these angels was just the thing to get me started. The angel on the left is thin cotton muslin, the middle one is silk organza, and the one on the right is silk habotai. I fused the images onto the background fabric and added Lumiere with handcut stamps. I particularly like the lotus pod stamp I made a while ago. And then I sewed beads on. I love this little piece, will hang it high in my studio somewhere so the angels can watch over me. The second piece for this week has one digital image of the angel and I'm looking forward to finishing it off. Working with sheers was wonderful, I'd like to do a lot more with them as my work evolves. This morning I finished all the quilting on my latest collage quilt. I think I like it best from this series. And I've got the second Lake Como quilt about ready to put together. Wishing everyone a lovely holiday this weekend -- safe, happy, warm, healthy, full of peace, love and joy! Yesterday I completed the first quilt based on my digital image of Lake Como, taken in late 2007. I'm calling this one Afternoon On The Lake, finished size 16x12 inches. The second piece has yet to be begun, but I do have a stack of possible fabrics ready to preview. Original image is the last photo below. Meanwhile, a few weeks back I began putting fabrics together for another quilt based on one of my collages from early this year. After originally thinking I would let it go, I decided yesterday that I would do it after all. Largely, because I printed a cool digital image on fabric specifically to use in this piece, and I do want to use it thus. 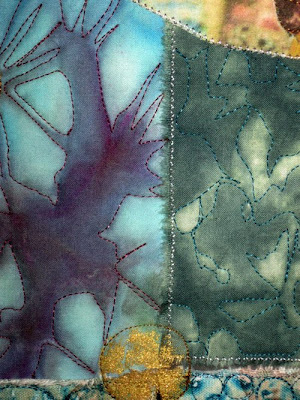 So these two quilts are on my agenda for this week, along with the last of my 2009 weekly quilts. And it's time for a party, this being the end of my first full year of art quilting! I will be announcing this again in a forthcoming post, but here's advance notice that I'll be having an Anniversary GiveAway on this blog -- one of my weekly quilts, framed and ready to hang. I'll say more soon, so stay tuned if you want a chance to be gifted with one of my quilts! And speaking of GiveAways, I'll be announcing another one soon on Collage Journey -- since it has also been a year that I've been collaging daily. The gift in this case will be a set of notecards with different collage images on each one. I will likely announce this giveaway here, as well as on Collage Journey, since I have lots more followers here. It's pouring rain out now, and I'm headed soon for the studio! Weekly quilt number 51/2009 ~ All That Glitters. 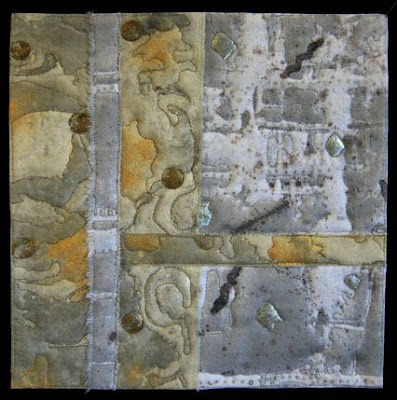 The silver half is a piece of linen painted with Lumiere and foiled. 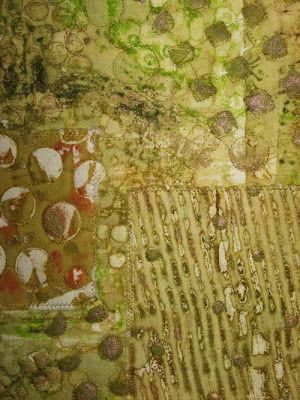 The gold half is a piece of suminagashied (ink on water print) cotton painted with Pearl Ex and Lumiere. And stitched with the best metallic thread I've found to date -- Gutermann. It's pouring rain on the North Coast today, hasn't stopped for a minute. Wet and dreary. I worked in the studio this morning but now I'm home. I may just get into bed and read! 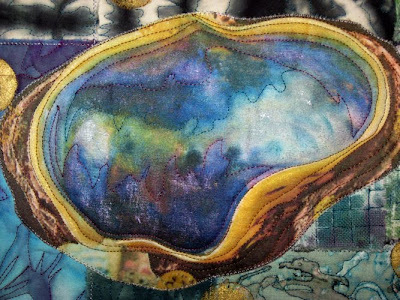 I spent much of today rebinding Skipping Stones, one of my very first art quilts, created in January of this year. I've always really loved the piece, photos don't do it justice. 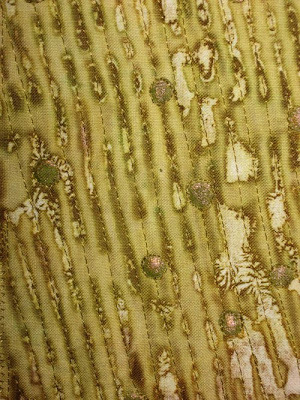 It's a whole cloth piece of heavy cotton that I printed with thickened dyes, then painted with Lumiere in strategic places before machine quilting it. My original method of binding the quilt was to wrap the edges of the backing around to the front, turn in an edge, and hand stitch it down. Kind of like doing a facing, but in reverse. That was how I bound all my first quilts because I didn't know any other method. Of course, I've learned tons this year, and I don't use that method any longer. Primarily, because the quilts don't lay flat. So today, I removed the sleeve and the label, undid the hand stitched edge, cut the edges straight all around, and stitched on another piece of handprinted fabric which I turned to the back of the quilt and tacked down. And now it's hanging in our home and I can enjoy it every day! I would have posted before now, but I didn't have a photo of any recent work although I was busy in the studio last week. 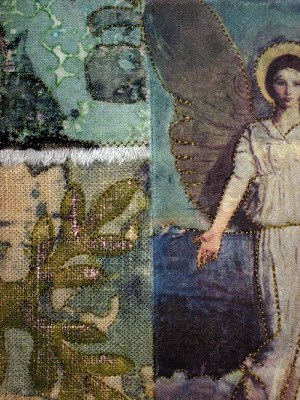 Here, instead, is the photo I'm using for my end-of-year one and possibly two quilts based on a digital image. 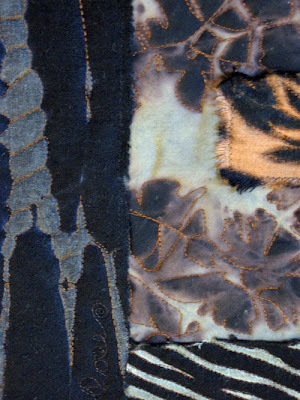 This exercise is a preview of what I'll be doing next year for my personal quilting challenge -- making two different quilts each month based on one digital image. 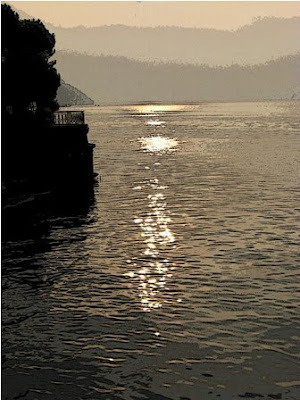 What you see here is the sun reflecting on the water on Lake Como, at Bellagio, Italy, taken two plus years ago. I have one quilt in the works now, to be quilted this week, and I'm quite sure I can complete a second one before year's end. I'm essentially finished with my Fiberactions "initiative" challenge quilt, just need to put the finishing touches on tomorrow. But it's all quilted, the faced edges are completed, and it's basically ready to go. 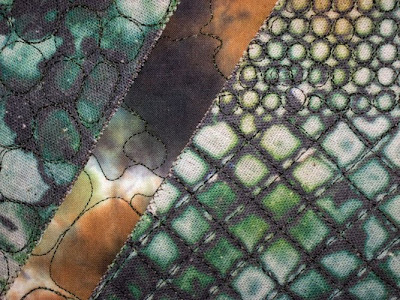 We'll be revealing our quilts on January 15, on our personal blogs as well as on the Fiberactions blog. If you're interested in musings a few of us have posted recently, about our process on this challenge, you can go to the blog now. We have a new family member in our home -- new kitty Kirby, and I'm glad to say BeeGee has already taken a shine to him. Thank God, that's what I was hoping for! As soon as I got real comfortable with my new Singer Confidence Quilter sewing machine, my Bernina came back from the shop. It only took 3 1/2 weeks -- not long considering the hassles I had with the dealer -- and it's running fine now and staying ON! The L-board went bad, that's the electronic gizmo that keeps the machine on instead of shutting itself off. There's definitely no substitute for a Bernina, but in all honesty there are things I like more about the Singer. In short I will say this: if you're a new quilter looking for a good machine with a lot of features and an unbeatable price, definitely check out this model Singer. That's all the creative news fit to print. I'll be back in a day or two with this week's 10x10" quilt, the penultimate in my yearly series. 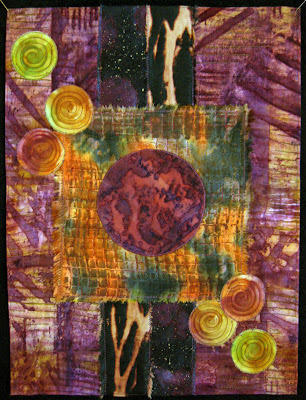 "No Rules" sounds like anarchy...this week's quilt, #50/09, is called Break The Rules. 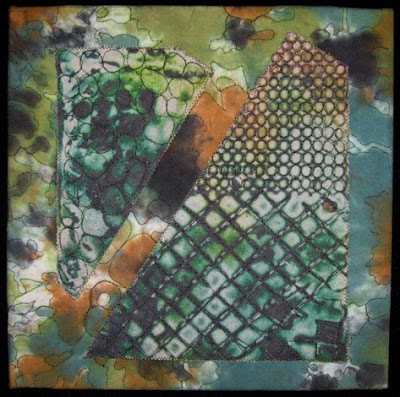 The two odd-shaped sections are parts of a digital print, the background a piece of low water immersion dyed muslin. I made this entirely today, while I was internally sifting and sorting options for my next set of quilts. 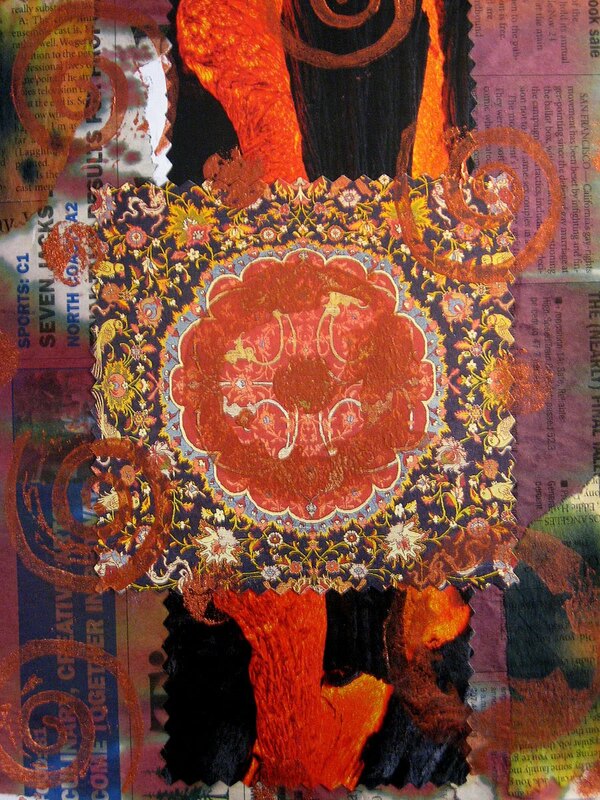 For now I'm finished with the collage quilts and am moving on to quilts inspired by digital photos I've taken. I decided today that my personal challenge for 2010 will be making two 16x12 quilts each month, both inspired by the same photo. This will give me a good opportunity to work out different design solutions for one source of inspiration rather than moving on too quickly to something else. Partly this is influenced by another online group called Digital to Textile, eight artists who use the same photo as inspiration for each different challenge. The range of their work, their completely different take on the same photo, is awesome. So I'm going to end this year with two quilts based on a photo I took in Italy two plus years ago. This afternoon I worked on the first one. Work also continues on my Fiberactions challenge quilt. It's being one of those projects where you think you know where you're going when you start, then step by step everything changes and you make different choices. The most important part for me is getting started and just letting it evolve without preconceptions. Each "mistake" I make leads to a better outcome. 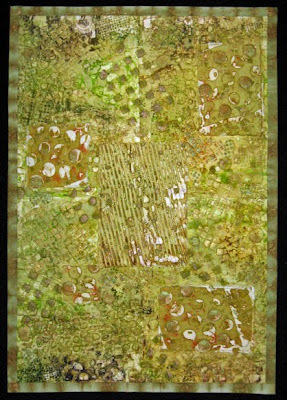 The latest green piece, entitled Chartreuse, finished size 16x23 inches. The foundation fabric is four deconstructed screen prints pulled on one piece of linen. I'd had the fabric for some time and every time I unfolded it out to look at it, it seemed to scream "Quilt Me!" So I added a few small pieces of other deconstructed prints and then strategically embellished the machine appliqued top with Lumiere. After quilting, I added the border/binding, a piece of shiboried cotton, then applied Shiva Paintstix around the edges to highlight the bronze areas. I actually finished the piece a few days ago but waited until the oil paint was dry before photographing it yesterday. Have a great weekend! Don't forget the 20% off sale at my Etsy Shop! I'm having a big Holiday Sale at my Etsy Shop, from NOW through Monday, December 7. Everything there is on sale at 20% off, including items that are already sale priced. If you're looking for original art for your holiday gift list, click on over to the shop ~~ I've got small and medium sized art quilts, handwoven art cloth, textile postcards, and a few handwoven scarves left. And everything is 20% off the listed price. Make your purchase through Etsy, and as soon as I have been notified of the sale, I will send you a discounted invoice through PayPal. All items will be shipped by the end of next week at the latest. If you're in Humboldt County, email me to purchase any of the listed items. Thanks for shopping, and Happy Holidays to all! This week's quilt, number 49/09, is quite a departure for me ~ hence its name, Departure. I really love this piece. The three vertical pieces are digital images, the bottom piece is a deconstructed print. rather than finishing the quilt with a facing on the back and then glueing that to a frame, I made the top big enough to stretch over a framed canvas, beyond the 10x10" quilted area. I'll just finish off the back with kraft paper and it will be ready to hang. There's a freedom in this piece, as well, that feels exciting to me. I think my art is changing...and that's a wonderful thing. Feels like I'm taking steps closer to where I want to be, closer to the art I want to be creating. I'm trying to work more spontaneously now, to not deliberate too long over all those decisions that go into the making of a piece of art. Trusting my gut, my instinct. That sense comes through for me in Departure. I also experienced that spontaneity in the 8x10" study I did a few days ago for Fiberactions' Initiative challenge -- I wish I could show it to you but I won't until January 15 when we post our finished pieces. Anyhow, I worked quickly to make that piece and I love how it turned out -- i.e., I'm happy with the solutions I arrived at to achieve what I wanted. I've completed three quilts recently based on paper collages, and although I'm putting together a fourth piece in this genre, I've pretty much decided against moving further in this direction. The first piece of the bunch was Snake Eyes, a tiled digital image on linen that was quilted pretty much right along the printed design on the fabric. I enjoyed making this piece and do love the finished product. But doing more of this very same thing feels too representational. 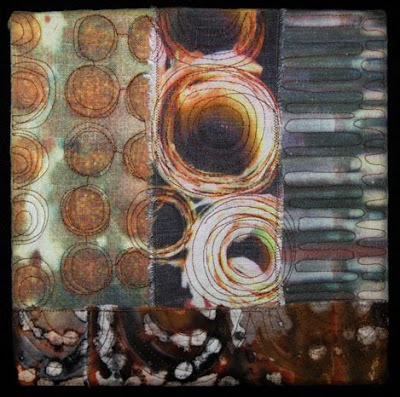 Or perhaps it seems too mechanical -- make collage, take photo, manipulate photo, print on fabric, make fabric/batting sandwich, quilt printed design. The second and third pieces in this series, Morning Prayer and Meditation, although I do like them, gave me the feeling that I was looking backward rather than forward. Making a quilt today based on a collage I created weeks, months, or even a year ago seems like moving in the wrong direction. 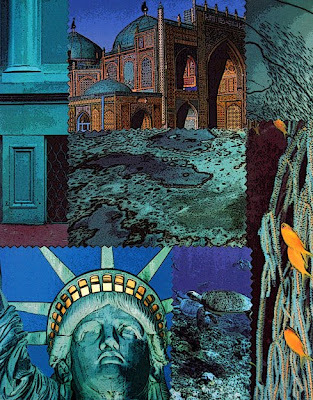 There was spontaneity in creating each original collage. Translating that into fabric, now, feels contrived. So stay tuned, to see what's next! I'm in the middle of a really busy day but I didn't have access to my computer last night -- so I wanted to get this latest quilt uploaded before I head into Eureka this afternoon. 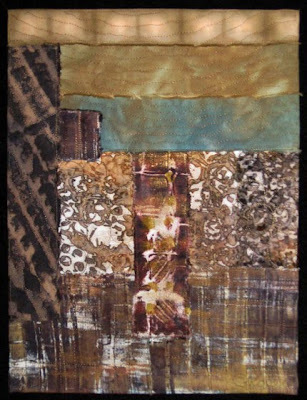 This piece, Meditation, is the next one of my quilts inspired by collages. The original collage is the last photo below. Finished size is 16 x 12. 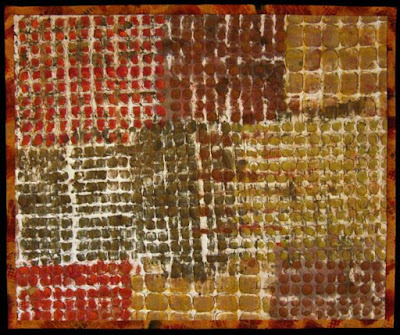 The background fabric was a piece that had about everything under the sun done to it! Dyed, painted, discharged, and finally deconstructed printed. 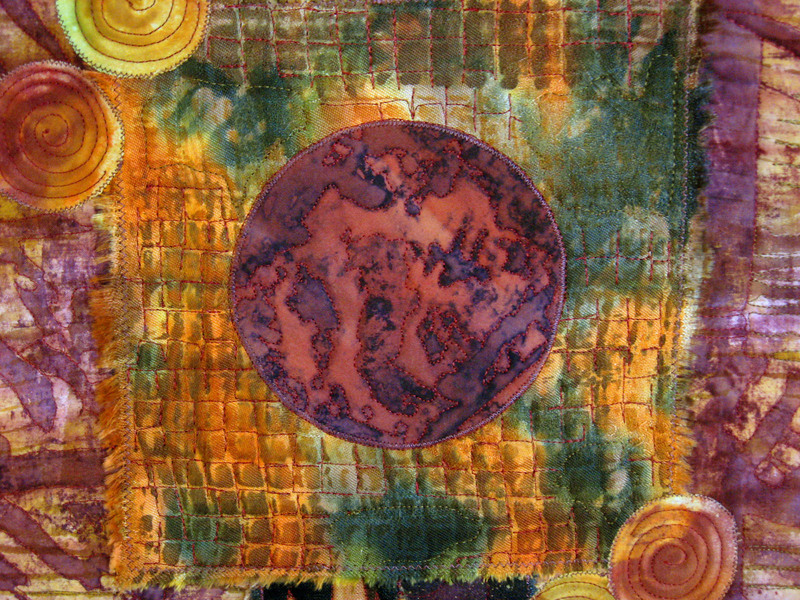 The orange and black piece in the middle was another old linen napkin -- those things are wonderful to use. I had a whole bunch of arty things on my mind to write about, but they'll have to wait until my next post -- that is if I can remember any of them!